You don’t have to be a geek to find these tips handy. Whether you’re battling backup crashes on .Mac or searching for lost files, these tips on troubleshooting and Terminal will give you some clever ways to crack Tiger’s code. instead, select another status message and then select the Current iTunes Track message. All should be fine. Have you ever wanted to remove unused files from a folder—for example, your user folder’s Preferences folder? Finding the files isn’t always easy—naming schemes are sometimes obvious only to the developer. 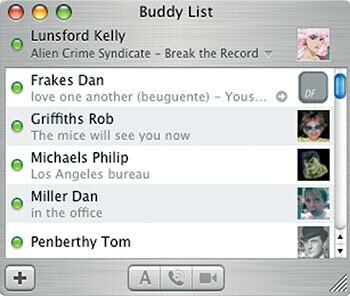 iChat Your Way Change the way iChat’s iTunes track listing lists your current hits. to look at the kMDItemAttributeChangeDate attribute to track changes to a file’s metadata, which is modified every time you or a program access the file. Unix geeks will appreci-ate that Tiger supports Access Control Lists (ACLs). ACLs give you more control over permissions than you get from OS X’s Info windows or even from standard Unix commands. For example, you can use ACLs to set unique access permissions for everyone who has an account on your Mac. and then enter your administrator password at the prompt.